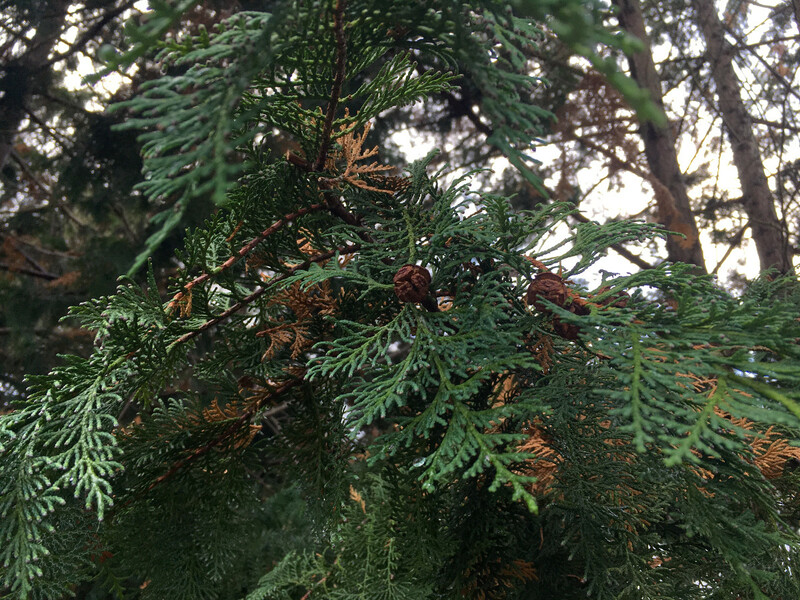 Evergreen tree, up to 40m tall, native to Japan and Taiwan, naturalized and cultivated elsewhere as ornamental and for timber; bark light reddish brown, peeling off in thin strips; crown narrowly pyramidal; branches drooping to pendulous; cones reddish, globose, small, about 5-10 mm in diameter; cone scales peltate. Main components of the essential oil from the leaves of C.obtusa were elemol (14.7%), α-terpinyl acetate (9.0%), bornyl acetate (7.1%), γ-eudesmol (8.2%), β-eudesmol (6.5%), α-eudesmol (5.3%), and γ-muurolene (5.7%). Main components of the essential oil from the wood of C.obtusa were α-cadinol (20.5%), τ-muurolol (18.5%), γ-cadinene (12.4%), δ-cadinene (10.8%), and τ-cadinol (10.6%). Hinokitiol (thujaplicin), was not found in the neutral wood oil of C.obtusa. Yoshixol (4,4-dimethyl-6-methylene-2-cyclohexen-1-one) was regarded as major constituent the neutral wood oil. Yoshixol showed strong antibiotic effects on MRSA, Escherichia coli, Mycobacterium chelonei, Pseudomonas aureginosa and Candida albicans. The essential oil of C.obtusa leaves contained α-terpinyl acetate (14.9%), sabinene (10.9%), limonene (9.6%), α-terpinolene (7.5%), α-pinene (7.1%), 3-carene (6.1%), terpinene-4-ol (5.7%), myrcene (4.9%), γ-terpinene (4.6%), bicyclosesquiphellandrene (4.1), γ-eudesmol (3.7%), widdrene (3.5%) and cedrol (3.1%).